Oriental Insurance Group Mediclaim Policy is a Health Insurance policy which takes care of medical expenses following Hospitalization/Domiciliary Hospitalization of the Insured in case of a sudden illness / an accident / any surgery during the policy period. Insured gets Group Discount, which is the major benefit under Oriental Insurance Group Mediclaim Policy. Oriental Insurance Group Mediclaim Policy will be available to any Group/Institution/ Association/Corporate Body of more than 50 persons/families provided it has a central administration point. 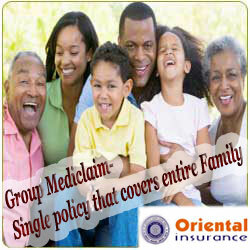 Each insured should cover all eligible members under one Oriental Insurance group mediclaim policy only. Required for age 45 years and above. Company shall not be responsible for non‐renewal of policy after the due date of the proposal form. Cashless facility is available in the Network Hospitals through the appointed TPAs of the Oriental Insurance company. 5% discount will be given on the scheduled premium if the proposer opts out of the Cashless facility. Under Oriental insurance Group Mediclaim policy, there is an optional cover that is Maternity Expenses and Newborn Child Cover, which can be obtained on payment of 10% of the total basic premium for all the insured persons. Group Discount is available depending upon total number of insured persons (families) at inception of the policy is allowed at the following scale. Company will reimburse the medical expenses incurred while the insured was admitted in the hospital as an in patient. Covers Room, Boarding and Nursing Expenses as provided by the Hospital or Nursing Home not exceeding 1 % of the Sum Insured or Rs. 5000 /- per day whichever is less. Covers I.C.U expenses not exceeding 2% of the Sum Insured or Rs. 10,000 /- per day whichever is less. Pre hospitalization expenses for 30 days before the Insured Person was Hospitalised. Post hospitalization expenses for 60 days after the Insured Person was discharged. Oriental Insurance Group Mediclaim Policy also covers Surgeon, Anaesthetist, Medical Practitioner, Consultants, Specialists Fees. Anaesthesia, Oxygen, Blood, Operation Theatre Charges, Medicines & Drugs, Surgical Appliances, Dialysis, Radiotherapy, Chemotherapy, Artificial Limbs, Cost of Prosthetic devices implanted during surgical procedure like Relevant Laboratory / Diagnostic test, pacemaker, X-Ray etc. Ambulance services: Company will reimburse 1% of the sum insured or Rs 2000/- whichever is less. Maternity Expenses and Newborn Child Cover Benefit Extension: It means treatment taken in hospital/nursing home arising from pregnancy, child-birth including normal caesarean section. This can be obtained on payment of 10% of the total basic premium for all the insured persons under Oriental Insurance Group Mediclaim policy. Pre hospitalization and post hospitalization benefits are not available under this section. Pre-natal and post-natal expenses are not covered unless admitted in Hospital/nursing home. For complete information about inclusions please refer Oriental Insurance Group Mediclaim policy guidelines and Oriental Insurance Group Mediclaim Brochure attached below. Injuries caused by War, civil war, revolution, invasion, act of foreign enemies, Nuclear energy, radiation, etc.,. Surgery for correction of eye sight, contact lenses, cost of spectacles, hearing aids etc. Any dental treatment which is corrective, cosmetic, filling of cavity, root canal including wear and tear etc. HIV or any related illness including AIDS and/or mutant derivatives or variations there of however caused. Massages, Steam bathing, Shirodhara and similar treatments under Ayurvedic treatment. Any treatment received in convalescent(recovering) hospital, convalescent home, health hydro, nature care clinic or similar establishments. Expenses incurred in treatment of obesity and any other weight control programme, services or supplies etc. For complete information about Exclusions please refer Oriental Insurance Group Mediclaim policy wordings and Oriental Insurance Group Mediclaim Brochure attached below. For more information regarding Tax Benefits, visit www.taxqueries.in. Notice of claim should be given to the Company / TPA by Fax, Email with particulars relating to Policy Number, ID Card No., Name, Nature of disease etc. Notice should be given to the company within 48 hours of admission or before discharge from Hospital unless waived in writing. Claim in respect of Cashless Access Services will be through the TPA provided admission is in a listed networked hospital and is subject to pre admission authorization. Upon getting the related medical details / relevant information from the insured person / network Hospital, TPA shall verify that the person is eligible to claim under the Oriental Insurance Group Mediclaim policy. After satisfying itself will issue a pre‐authorisation letter to the Hospital mentioning the sum guaranteed as payable, also the ailment for which the person is seeking to be admitted as in‐patient. The TPA may deny pre‐authorisation in case the hospital / insured person is unable to provide the relevant information or medical details as required by the TPA. In such circumstances the insured person may obtain the treatment and later on submit the full claim papers to the TPA for reimbursement within 7 days of the discharge from Hospital. Should any information be available to the TPA which makes the claim doubtful requiring investigations, the authorisation of cashless facility may be withdrawn. Enclose the following documents during Oriental Insurance Group Mediclaim policy – claim settlement. Discharge certificate/card from the Hospital. Bill, Receipt and Cash Memos from the Hospital/Chemist(s), supported by the proper prescription and duly attested by the insured person. Receipt and Pathological test reports from a Pathologist supported by the note from the attending Medical practitioner/Surgeon demanding such Pathological test (s). Surgeon’s certificate stating nature of operation performed and Surgeon/s bill and receipt. Attending Doctor’s Consultant’s / Specialist’s/ Anaesthestist’s bill and receipt and certificate regarding diagnosis. Certificate from the attending Medical Practitioner / Surgeon that the patient is fully cured. You can calculate the premium using Oriental Insurance Group Mediclaim premium calculator. Personal details, Policy period, Number of members, Age and Sum assured and other details are required to calculate the premium. What is meant by Domiciliary Hospitalization benefit? The patient takes treatment at home on account of non availability of room in a hospital. Who can be covered in the name of Group policy? Oriental Insurance group mediclaim policy will be issued in accordance with IRDA guidelines, in the name of the Group with a schedule of names of the members including his/her eligible family members as per the following definition. Give me information about cancellation of the policy? Company may cancel the policy at any time, by sending the Insured 30 days notice by registered letter at the Insured’s last known address and in such an event the Company shall refund to the Insured a pro‐rata premium for un‐expired Period of Insurance. Insured may cancel this policy at any time and in such event the Company shall allow refund of premium at Company’s short period rate only (table given here below ) provided no claim has occurred during the policy period up to date of cancellation. What is meant by TPA (Third Party Administrator)? TPA means any Company who has obtained licence from IRDA to practice as a third-party administrator and is appointed by the Company.